Swaged superheater tubes for the C&NW 1385 arrived on August 27, 2010 and were placed in storage for eventual use in the new boiler. 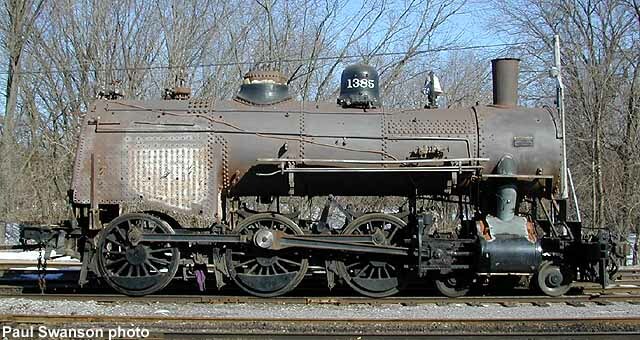 C&NW #1385’s initial restoration efforts were documented within the pages of the Mid-Continent Railway Gazette and Mid-Continent’s The Steamer! newsletter and were not documented online. The following is an overview of #1385’s status written for the website as of June 29, 2006. The image most people have of Mid-Continent involves the Chicago & North Western #1385 under steam, pulling either the Prosperity Special or the Circus Train or one of our own special excursions like Snow TrainTM or the Santa ExpressTM. The power of this image is so strong that museum guests still come here expecting to see the R-1 sitting in front of the depot, ready to make the day’s runs, even though she has been out of service since June of 1998. We knew several years ago that her time was limited and began a fund raising campaign in 1996 entitled “Help Steam Live.” The campaign goal was a mere $250,000, when we thought the needed repairs would simply be tube and flue replacement plus patching the interior side-sheets of the firebox. But once the work commenced, the extent of the firebox damage from over eighty years of service became apparent. 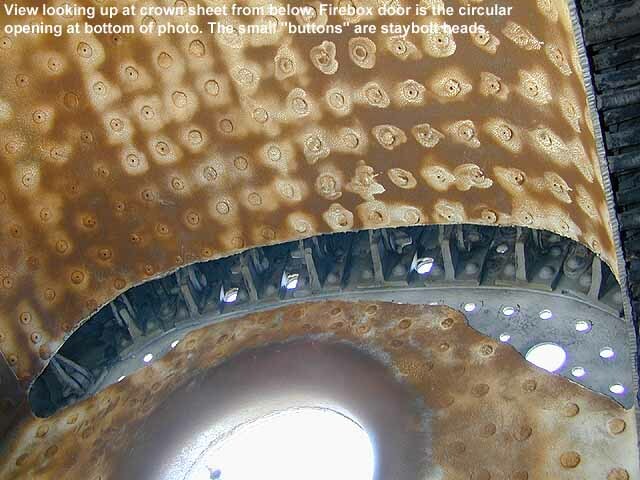 The result of a visual inspection by the State’s boiler inspector was the condemnation of the firebox. 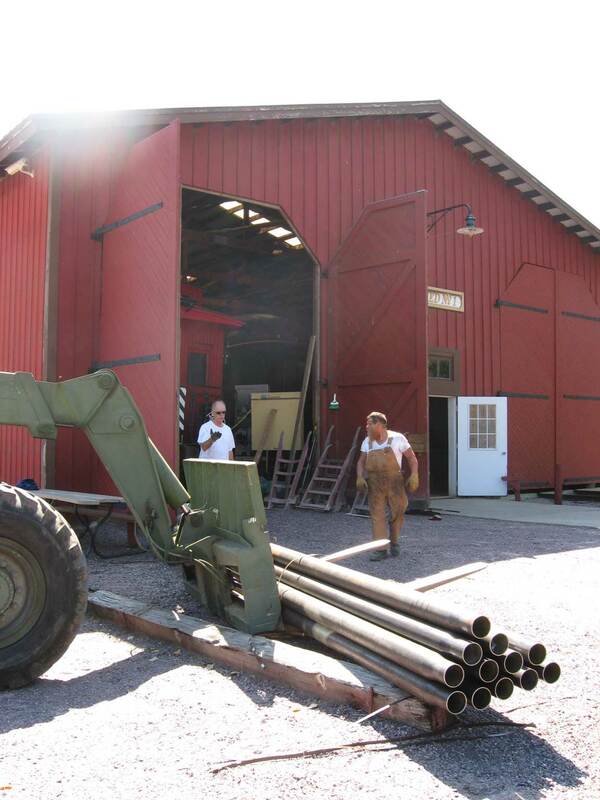 While Mid-Continent’s volunteer shop crews wrestled with the decisions on how to proceed with the repair work, Federal guidelines for steam boiler operation changed, mandating even further major repairs. 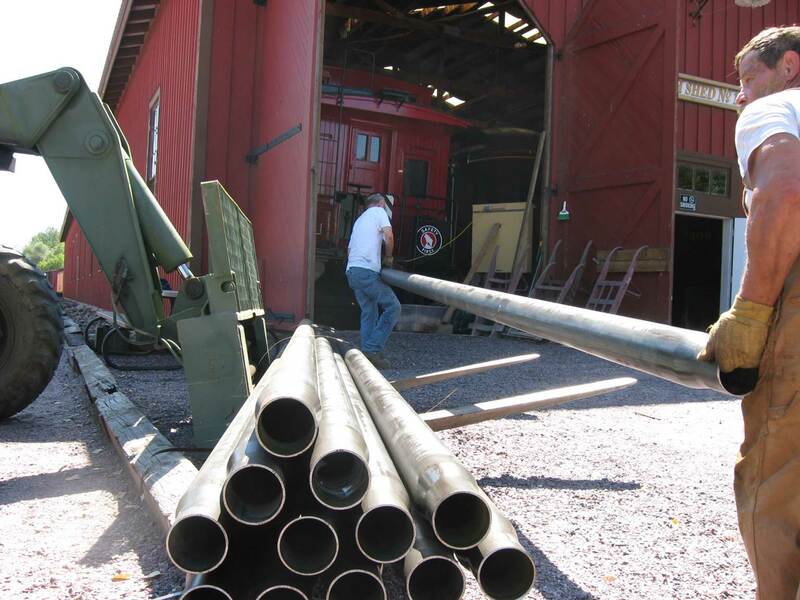 The museum engaged Steam Services of America in 2001 to perform a complete inspection of the boiler in light of these new requirements. 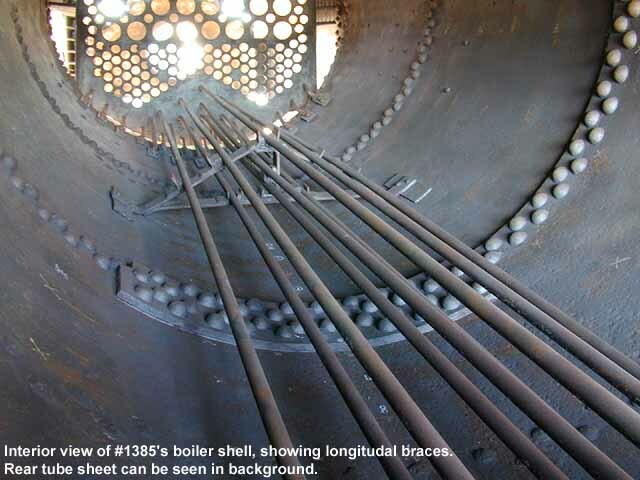 The result was a significant expansion of the repair plan to encompass a major overhaul of the entire boiler. And the new price tag approached $750,000, well beyond the money raised by the “Help Steam Live” campaign. 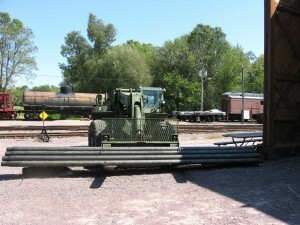 The R-1 was parked in favor of repairing less costly locomotives. Still the museum was holding a significant amount of money restricted for the purpose of restoring this specific locomotive to operating condition. 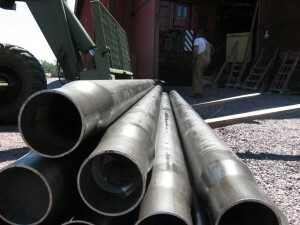 So in 2004 an agreement was entered with Deltak Construction Services of Plymouth, MN for the manufacture of a completely new boiler using all-welded construction techniques. 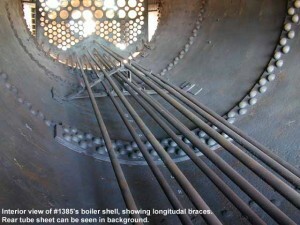 The cost of $415,000 proved to be significantly lower than the cost of repairing the old boiler. And the long-term maintenance cost would also be less, insuring the R-1’s ability to operate far into the future. Phase 1 of this program is now complete with Deltak delivering the engineering study and approved boiler drawings to the museum. Phase 2 will be the purchase of the needed materials. And Phase 3 will involve the boiler’s actual construction at Deltak’s shop, concluding with a successful hydro test. When finished, the C&NW #1385 will be the most expensive of the three steam locomotives currently under repair. And that is why she is at the end of the list in terms of priority. But no concept of a steam program at Mid-Continent has ever been considered that would exclude the R-1 from being returned to operating condition. She is the gem of the steam locomotive collection. View a history of C&NW #1385 here. This drawing of an Omaha Road Class I-1 boiler, a sister engine to #1385, shows the portions of the boiler involved in future boiler work: firebox (yellow), throat sheet (blue), and boiler barrel (red). C&NW #1385 in April 2001. 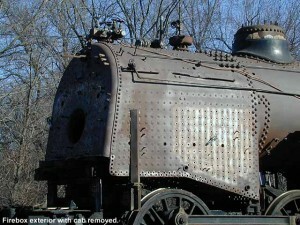 C&NW #1385 firebox exterior with cab removed. Interior view of C&NW #1385’s boiler shell, showing longitudal braces. Rear tube sheet can be seen in background. Looking toward rear of C&NW 1385’s firebox. 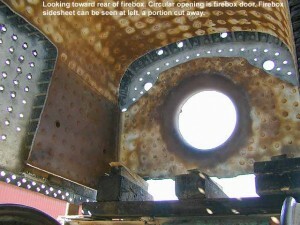 Circular opening is firebox door. Firebox sidesheet can be seen at left, a portion cut away. 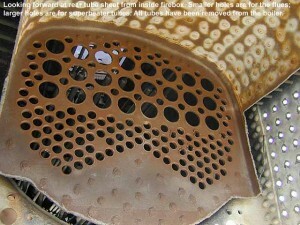 Looking forward at the rear tube sheet from inside firebox. Smaller holes are the flues; larger holes are for superheater tubes. All tubes have been removed from the boiler.